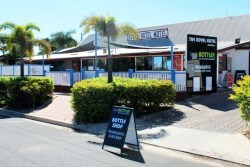 The Royal Hotel is located in Hughenden, which is approximately 380km west of Townsville and 520km from Mount Isa. Hughenden is located where the Flinders Highway, Hann Highway, Muttaburra Road and the Kennedy Development Road all meet making Hughenden a central location between several different townships in north-west Queensland. Hughenden can be accessed via car, plane, train and bus. From Townsville – Follow the Flinders Highway west from Townsville 380km until you reach our town of Hughenden. As you come into town you will cross two railway lines. As you cross the second railway line turn to your immediate left, this is Moran St and we are 10m down on the right hand side. From Winton – head north-east on the Kennedy Development Road for 216km until your reach Hughenden. As you come into town follow the signs directing you to Mount Isa, continue following this road as you go past the rain station on your right and the school on your left. Moran St is the intersection with the Flinders butchery on the corner to your right. Turn right into this street and the Royal Hotel is 50m down on your left hand side. From Mount Isa – follow the signs on the Flinders Highway to Hughenden. Once in Hughenden continue following the sings directing you to Townsville. Turn right into Moran St just before the railway crossing and we are on the right approximately 10metres down. Hughenden is also accessible from the north via the Kennedy Development Road. This road is not completely sealed and is rough in some parts, conditions of this road may also change quickly depending on the rainfall in this area. It is a good idea to check with the Flinders Discovery Centre before embarking on this road. The plane to Hughenden runs on Monday, Wednesday and Friday with only one flight scheduled each day. It can be boarded from Townsville where Hughenden is the first stop on a route to Mount Isa. Flights also depart from Mount Isa flying through to Townsville and stopping in Hughenden. If this is your mode of transport to Hughenden please let us know and we will gladly organise your collection from the airport. Bookings for this service can be made online at www.rex.com.au. Greyhound is the bus company that runs from Townsville through to Mount Isa and other destinations in between. This service runs only on Tuesday, Thursday, Friday and Sunday. The bus departs from Townsville at 7am and arrives in Hughenden around 12.15pm. Buses from Mount Isa to Hughenden depart at 7.10am and will travel all the way through to Townsville. Bookings can also be made on line at www.greyhound.com.au. There is a train service run by QLD rail that departs Townsville stopping at all destinations through to Mount Isa. This train service only runs on Sunday and Thursday from Townsville to Mount Isa and Tuesday and Saturday from Mount Isa to Townsville. Our hotel is conveniently located within walking distance from the train station. Please check arrival and departure times as well as make your booking at www.traveltrain.com.au.